Specification: SE-Test India is the leading ductility testing apparatus manufacturers in India. Our apparatus model SET-1312 has been developed as per the international standards that are followed by the testing labs and professionals. SET-1312 complies with the standards – IS 1208–1058, ASTM D 113, AASHTO, IP32 and T51. Three bitumen aggregate samples can be tested simultaneously thus reducing the time for the professionals on site. The carriage moves smoothly through the single phase 230V (50Hz) AC motor that drives the reduction gear. Two speed options of 5mm/minute and 10mm/minute are available which allow differentiated analyses of various bitumen aggregate samples. Stainless steel water bath is integrated to the apparatus that offers temperature control thermostatically. 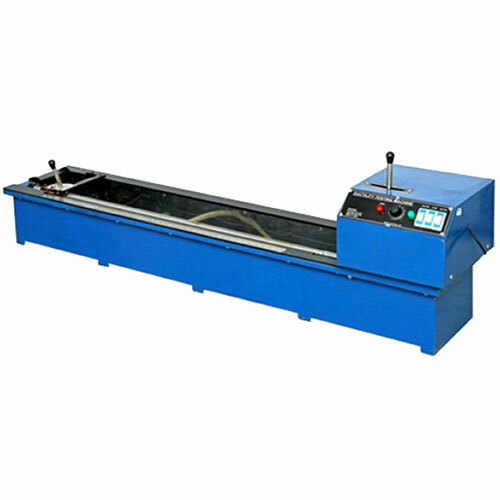 The water bath itself is insulated through a wooden case that further keeps the temperature stable and better ductility testing results are thus obtained. Adherence to the quality standards makes us the top ductility testing apparatus suppliers in India. The apparatus has been developed with the best quality materials together with high grade insulation that make it safer. We are therefore the number one ductility testing apparatus exporters in India.